Fanny Singer: Mom, I thought it might be nice to start by talking about our recent project, "My Pantry," and about what it was like to work together. Alice Waters: Well, I always say that my favorite part of the project was going on the book tour because I got to hang out with you so much! I mean, with you living in London, we rarely get so much time together—it was a dream! It's true, it was pretty special: days on end of being together at the same hotel, going on early morning walks, trying to remember the exact recipe for za'atar on the spot while recording Diane Rehm's NPR show live… But going back to the original question of what it's like to collaborate with your kid, there's really nothing more rewarding. Because of course you've influenced them in so many ways—and are thrilled if they like to eat salad as much as you do!—but then they become their own person, with their own talents, and it's exciting to think of how they might enrich your own projects. I had helped you with writing projects in the past, but this was really our first proper book project together, and was especially compelling for me because I also got to paint all the illustrations for it. Speaking of which, if you had to choose one drawing, what was your favorite? Well, I found them all so charming. But I loved the cover illustration best. It captures how I arrange and store things in my own kitchen: rather than stick something in a plastic container, I'll put it in a beautiful bowl and use a small plate as a lid. You also, of course, need certain tools in the kitchen to keep things running smoothly. What's your most indispensable kitchen implement? My mortar and pestle, of course! My marble mortar is easily my favorite thing in the kitchen, and if I could only have one piece of 'equipment' it would be this. It's such a basic tool, and has been around for thousands of years, but using it also feels like engaging in alchemy— ingredients transform in shape and texture and become something more than the sum of their parts. And it allows you to keep close to the taste, too, to able to smell and taste and tweak in a very immediate way. I always use my mortar to make salad vinaigrette: I pound a clove of garlic with coarse salt to a paste and then add in vinegar or lemon and allow it to macerate a moment before stirring in olive oil. I have several mortars, but the other one I use frequently is a Japanese suribachi, a ceramic bowl scored in a cross-hatch along the inside, which is perfect for making salad dressings and grinding spices. I think it's not too much of a stretch to think of the ethos of "My Pantry" as quite similar to my design and fashion project, Permanent Collection: a curated selection of the most classic historical and contemporary design originals, remade in luxurious materials—the most essential pieces, be it a coat or a sandal or a ceramic cup, that no woman can live without. In a sense, my partner, Mariah Nielson, and I are making an expanded pantry, or a wardrobe conceived on the same principles: full of only the most essential, beautiful ingredients. I can't wait for you to start making pieces for the kitchen! Soon! 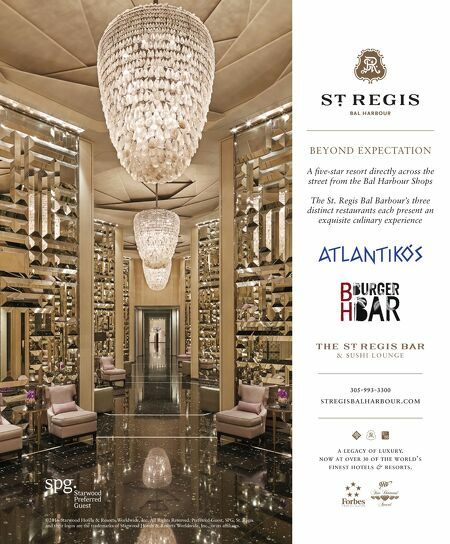 We'll have to come trawl through your cabinets for inspiration! 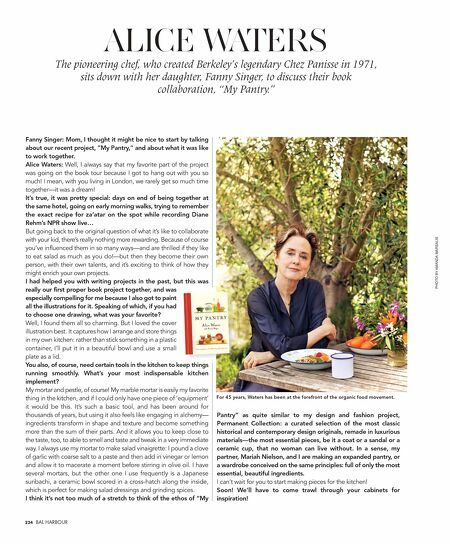 224 BAL HARBOUR ALICE WATERS PHOTO BY AMANDA MARSALIS The pioneering chef, who created Berkeley's legendary Chez Panisse in 1971, sits down with her daughter, Fanny Singer, to discuss their book collaboration, "My Pantry." For 45 years, Waters has been at the forefront of the organic food movement.